Enugu State Governor Ifeanyi Ugwuanyi has mandated contractors handling various government projects in the state to ensure that they continue to deliver quality jobs and adhere to the contract completion deadline. Ugwuanyi, who spoke through his deputy, Mrs. Cecilia Ezeilo, when she paid unscheduled visits to some ongoing projects for inspection, reiterated the state government’s unflinching commitment towards providing quality infrastructure for the people of the state to continue to enjoy more democracy dividends. The sites inspected include the Ogurute-Mkpamute-Igogoro-Ikpamodo-Okpo-Amaja road and the Ogurute – Umuogbo-Umuopu-Ette road in Igbo-Eze Local Government Area; the Enugu State Waste Management Authority (ESWAMA) dump site road at Ogui, Enugu North L.G.A. Others include the Igbo Ano Specialist Hospital; the Agbani District Hospital, Nkanu West L.G.A; Nsukka Magistrate Court building and the erosion control project along Ugwogo Nike –Opi Nsukka road. Mrs. Ezeilo, who was accompanied to the project sites by the Commissioner for Works and Infrastructure, Engr. Greg Nnaji, said that the essence of the inspection was to ensure that the contractors lived up to expectation and “deliver these essential amenities to the benefiting communities on record time”. While receiving the deputy governor and her entourage at Enugu Ezike in Igbo-Eze North L.G.A, amid excitement from a mammoth crowd, the traditional ruler of Umuoma Okpo autonomous community, HRH Igwe Patrick Okeyi described the on-going infrastructural development in Enugu State under Governor Ugwuanyi as unprecedented. The royal father, who applauded Gov. 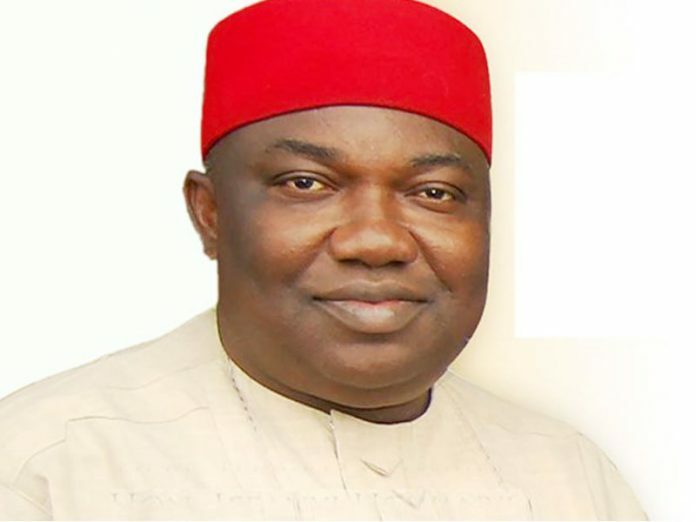 Ugwuanyi’s grassroots development initiatives, stated that he had never witnessed such strides being executed in the rural areas to connect adjoining communities, adding that the projects have given the dwellers a sense of belonging. His words: “Your Excellency, I have to say that since the creation of this state, I have never seen this type of development. This ongoing road project connects seven communities and links us to Kogi State. The communities are agrarian areas and inaccessible road hinders our efforts in producing food and bringing them to the markets. So, we are grateful to you, Your Excellency”. Also speaking, the Chairman of Igbo-Eze North L.G.A, Comrade Uwakwe Ezeja, extolled the governor’s leadership qualities, stressing that his selfless service has impacted positively on the lives of the people of the area in particular and the state in general. Represented by his deputy, Hon. Luke Uroko, the council chairman said: “Your Excellency, we are proud of you. You have wiped away our tears. We say thank you and assure you that we shall reciprocate through our massive votes in 2019.